Washington, DC – Tonight, at an event attended by hundreds of top Democratic and progressive campaign insiders and joined by thousands more through an online live stream, leading tech company NGP VAN launched the next major chapter in the evolution of the progressive political technology ecosystem and set a path that will continue to give Democrats and progressives a tech edge. The biggest announcement is the new Innovation Platform, a set of tools to allow developers and other technologists to quickly build and integrate political applications with the apps and data they already use through NGP VAN. The Innovation Platform will enable Democratic and progressive capabilities to run integrated multi-channel contact programs targeting individuals, across domains like fundraising and field, both online and offline. As new contact channels emerge, such as person-targeted online and TV ads, or social networks, NGP VAN’s ecosystem of tools will allow Democrats and progressives to add those channels, and run the most effective and efficient campaigns, by having a unified view into their contacts. NGP VAN released part of the platform in partnership with the Democratic National Committee, as part of the DNC’s “Project Ivy.” NGP VAN tools are used by virtually every large and medium sized Democratic campaign and progressive political non-profit, and thousands of smaller ones -- making NGP VAN a logical hub for the ecosystem. NGP VAN also showcased the largest redesign and update of the VAN organizing product in seven years – the technology platform behind the historic Obama 2008 and 2012 field programs. Other products showcased include the Action Center, an online office where supporters can leverage their existing relationships to take meaningful action on behalf of the causes they support; and the new version of the NGP fundraising and digital product, the most powerful fundraising tool available to progressive organizations and Democratic campaigns. The new set of APIs for the NGP VAN products are built on the easy-to-use RESTful architecture. This allows campaigns and companies to pull information from, and push information to NGP VAN, and use our services. VAN APIs are behind the recently releasedDNC Arbor Project, the next generation voter registration toolset, and MiniVAN, the iOS and Android apps that power mobile canvassing. 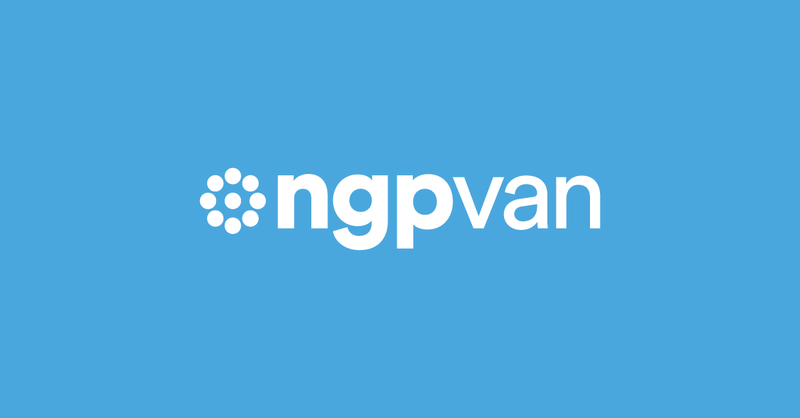 A recent NGP VAN hackathon produced Open Virtual Phone Bank which allows users to publish their call lists to a publicly accessible webpage, empowering supporters anywhere to reach a target universe the campaign has identified without needing to log into the VAN itself. The ActionID user account system, adopted by the DNC for VoteBuilder and being implemented across all NGP VAN products, will allow the hundreds of thousands of existing users of the NGP VAN tools to login to other apps with one simple secure login that they can take from campaign to campaign. ActionID also provides valuable data by tracking the activity of supporters: for example, with MiniVAN using ActionID, a campaign can now know which person canvassed which voter (instead of often just knowing that the voter was canvassed). NGP VAN also released ActionTag which allows a campaign or organization to embed an NGP VAN form on any web page. Now, when an ActionTag form is submitted, a linked record goes into both the VAN and NGP databases with the correct coding for each. Additionally, the form may be prefilled with a person’s ActionProfile (including, optionally, their credit card information, enabling single click contributions). Over 11 million ActionProfiles exist, and NGP VAN clients are seeing that a third to half of their forms are now prefilled, leading to higher conversion rates for online contributions, petitions, volunteers signup and more. Democratic clients that will benefit from today’s announcements include every national and state party committee, national organizations like Ready For Hillary, every Democratic Senator running for office, almost all the House members running for office, and thousands of statewide, state legislative, and down-ticket candidates. Progressive clients include all the major umbrella organizations like America Votes and the AFL-CIO, as well many others like Organizing for Action, the NAACP, EMILY’s List, and the League of Conservation Voters. NGP VAN is the leading technology tools and infrastructure provider to Democratic campaigns, progressive organizations by offering clients an integrated platform of the best finance, field organizing and digital tools.